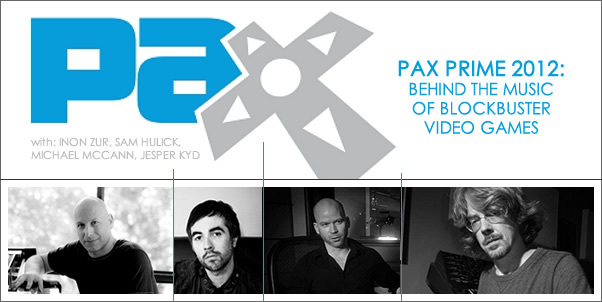 PAX PRIME 2012: "BEHIND THE MUSIC OF BLOCKBUSTER VIDEO GAMES"
Ever wondered what it takes to score original music for AAA video games? Learn from four of the industry's most accomplished composers with diverse musical backgrounds as they share their experiences and discuss the craft of scoring music for some of the biggest franchises in interactive entertainment. Featuring multiple award-winning composers Jesper Kyd (Darksiders II, Borderlands 2, Assassin's Creed I & II, Assassin's Creed Brotherhood & Revelations, Hitman 1-4); Michael McCann (Deus Ex: Human Revolution, Splinter Cell: Double Agent); Inon Zur (Dragon Age I & II, Prince of Persia, Fallout 3, Fallout: New Vegas, RIFT); Sam Hulick (Mass Effect, Mass Effect 2, Mass Effect 3). Moderated by Emily Reese, Host & Producer of Minnesota Public Radio's "Top Score" podcast. Plus giveaways and a surprise guest! The panel will be followed by a Meet & Greet / Signing session.